Mad About the Boy? by Dolores Gordon-Smith: Synopsis and Online Purchase Options. 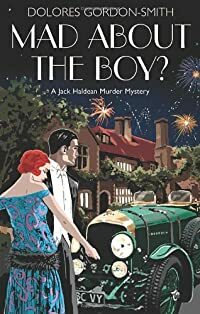 Synopsis (from the publisher): It's the height of summer 1923 and Isabelle's parents are celebrating their Silver Wedding with a ball at their country house, Hesperus, in Sussex. Isabelle has a problem: two men, the glamorous, earnest Malcolm and the quiet, troubled Arthur are in love with her, but worry is soon replaced by tragedy. One of the guests apparently commits suicide at the ball. Jack Haldean thinks it's murder, but everything is thrown into chaos when a group of Russian Revolutionaries become involved in the affair. In a case involving deception, greed, jealousy, kidnap, torture and more murder, Jack faces an agonizing choice on his journey to the truth – a journey which will change Isabelle's life forever.